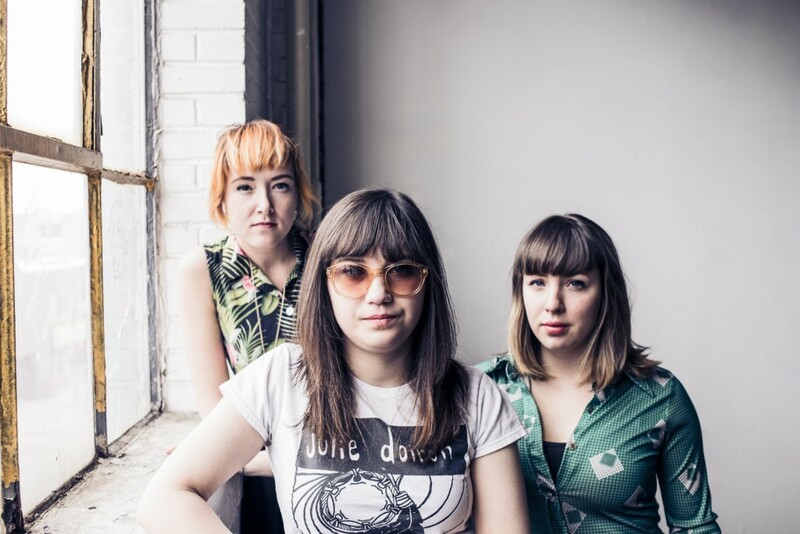 A group brought together by either fate or coincidence (depending on your point of view), Moncton roots trio Les Hay Babies is now reaping the rewards of their hard work. Formed in 2011, the group, composed of Vivianne Roy, Katrine Noel and Julie Aube, quickly built a loyal fan base in New Brunswick and Quebec while also touring through Europe on numerous occasions. They released their debut EP Folio in July 2012, delighting audiences with their vocal harmonies as well as their relatively simple instrumentation of guitar, banjo and ukulele. The newest record from Les Hay Babies, Mon Homesick Heart, reflects the growth and experience that the group has amassed over the last few years. Released earlier this spring, the group celebrated the record’s release with shows in Montreal and Quebec City last month. Now the time has come for them to be feted by their hometown: Les Hay Babies performs at Memramcook’s Monument Lefebvre on Thursday evening. Les Hay Babies sought to expand their horizons with Mon Homesick Heart, which was produced by Francois Lafontaine (Karkwa, Galaxie). This included beefing up their ranks and their sound, becoming a full-fledged band for the first time. Julie Aube says that while they could have taken the easy route and made a record that continued on the indie-folk tradition of the FolioEP, none of the band members was really interested in doing so. “Instead of recording in a cottage and being somewhat limited to the technology we had at our disposal, as was the case for Folio, we opted for a fully equipped recording studio where we could realize a few more ambitions,” Julie says. “Looking back, the EP was a good snapshot of where we were at during that time. At the time we recorded it, we had only been a band for a few months, and so it made sense for us to have made the record in the manner we did. “Going into the making of this record, we spoke with a few people who had the idea that our new record should be us recording somewhere in the woods and all singing around one microphone. That would have been cool, but we didn’t want to necessarily cling to an idea just because it had worked for us the first time. Julie says that Francois played a key role in helping realize their bigger visions for the album and encouraged the trio to follow their intuitions. Julie says that as surprising as the group expanding their line-up and sound may be to some listeners, she and her bandmates always saw the group eventually heading in this direction. They simply didn’t anticipate that it would happen this early in their career. “We always kind of daydreamed about having other musicians to play in the band. We just didn’t expect it to happen so soon. We couldn’t be happier, though. “After almost three years of non-stop touring, it is nice to bring something else to the table. Viv, Katrine and I still write all the songs and do all the interviews for the band, but it is great having others to lean on live. We are all excited to play these new songs and present a new concept to our show for people to enjoy. “Plus, we get to rock out more with a full band behind us,” she laughs. Les Hay Babies recently returned from a series of shows in Louisiana, one of their first forays south of the border. Despite going into the shows not really knowing what to expect and wondering among themselves how francophone music would go over to a predominantly anglophone audience, Julie says that the experience couldn’t have been better. “None of us really knew what to expect. We were so far from home, we couldn’t help but wonder how many people were going to understand French and get what we were trying to do. The audience was so gracious, though. There were many Cajuns that did speak French that told us how much they appreciated us being there. Less than a week after their upcoming show in Memramcook, Les Hay Babies will be getting ready to cross the Atlantic Ocean for yet another European tour. In addition to summer shows in Quebec, the group will also perform at the Congres Mondial Acadien being held in northern New Brunswick in mid-August. Julie shares that the group is hopeful they can finally spread their wings in Western Canada before the year is through as well. Tickets $15 for members, $20 for non-members. Tickets are available for purchase at the venue (Monday to Saturday, 10 a.m. to 5 p.m.), at Theatre de l’Escaouette (170 Botsford St., Moncton) and by phone (506) 758-9808.